There’s a common misconception that all redfish are pushovers on fly. The fairytale being that this species as a whole is fantastically oversized and easily bamboozled with fur and feathers. We’ve been led to believe that you just bomb a fly, any fly, in their general vicinity and prepare to get down and dirty. But if your reality is anything like mine then you know that not all redfish look like Louisiana lunkers and they’re certainly not all agreeable to any offering provided. The ones in my backyard, in and around southwest Florida’s Pine Island Sound, generally behave more like permit, requiring more than just a close enough cast and dumb luck. These fish are routinely run over by powerboats, and due to a steady barrage of local tournaments, they are well educated when it comes to what they put into their mouths. For a long period of time, my redfish scorecard was full of refusals and lost opportunities. That stretch of failures really got me thinking about the flies I was throwing. The patterns outlined in this book have been fine-tuned and rigorously tested on countless grass flats, oyster bars, and mangrove shorelines. 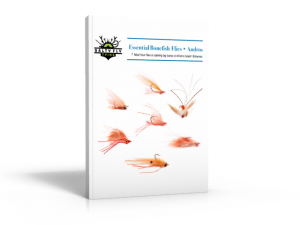 Tying and stocking your box with this proven assortment of flies will ensure you have the ammunition needed to coax even the most refined redfish, and the insight provided in the interviews of the contributing guides and tying gurus will help you understand what factors need to be considered to create your own productive redfish flies. Step-by-step tying instructions for tying “Flip Pallot’s Bushwood”, “Cave’s Wobbler”, “Epoxy Spoon Flies”, “Mylar Spoon Flies”,”Bailey’s Claw Seaducer” and “No Name Shrimp”, my Swamp Cabbage Shrimp, and Modified Tampa Bay Redfish Fly. Eight proven patterns for catching redfish. This book is a 177-page paperback illustrated with ultra-hi resolution images. Insights from saltwater fly tiers and guru’s including: Flip Pallot, Capt. Steve Bailey, Capt. Codty Pierce, and Jon Cave.